The next few moments were so confused, that Kipp himself could not explain them fully when he was later debriefed back on Earth. For some reason, he felt impelled to drop everything and go and take a look at the doors. Were they true doors? He just had to find out! Mission control? Kipp knew he had no business doing what he was doing, and he flicked off his uplink--dangerous, of course, but mission control, despite the images they were receiving might think he had good reason to be deviating from the schedule. And, preoccupied by the loss of communications, they would be frantically working on that problem for the next minute or two before they tracked the shut-down to his own thumb. Then they would have to decide if it was intentional or not, and by that time he would think of some good explanation--at least that was his intention. Running, he was surprised how long it took to follow the drag marks and reach his objective. When he stood at the doors, they were immense, far larger than they seemed back at the land rover. And they were doors, reminding him of the hangar doors of that early Space Age dinosaur, the Kennedy Space Center Museum, only grotesque, snake-entwined columns flanked the portal like a temple scene out of the bygone, Raj-ruled Subcontinent of India! Kipp’s heart began to do funny things at this point. How was he going to explain this discovery? He knew he couldn’t! For the first time in his entire career, he would be forced to acknowledge before everyone that science and space exploration were all wrong--totally mistaken! He didn’t have to think it. He could see it with his own eyes. Doors leading into the base of the monolith--left open a crack too! He could see through, and he did--with enough UV glare to give him a good view for a long distance. He saw what could be a hanger for spacecraft--that was his first impression. Then at the far end, more doors, which looked tiny but he now expected to be quite massive. In the silence that beat like heavy metal percussion inside his headgear, Kipp thought furiously, trying to make sense of the data around him. Artifacts of an extinct but highly advanced Martian civilization? Wouldn’t the science fiction aficionadoes and the radio talk jocks back on Earth love that! Kipp easily slipped through the crack and strode through the hangars to the bulkhead doors at the other end, his limbs moving in a kind of dream or trance. He knew that he had thrown away his career at this point. How could he ever explain his behavior to mission control? They would never forgive his running off on a lark to do his own thing while the instruments, costing half a billion, were losing half to three quarters their life expenctancy in the UV as he played explorer. Suddenly, crashing through his brain, he heard music! Kipp was so overwhelmed he fell to the ground. Frozen, he peered up and around, wondering if he was going bonkers. That sultry, sad, superbly measured voice? It was classic! But whose? 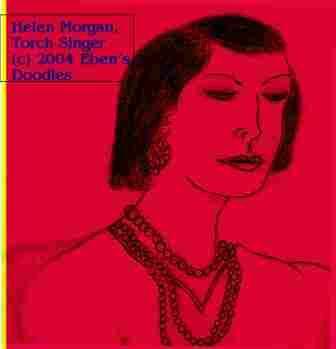 Yes, Helen Morgan’s--the early blues and torch singer who never raised eyes to a camera if she could help it! He could bet and win that he was the only guy in NASA with a complete collection of her phonograph singles. Finding it out somehow, mission control had sent along a tune of hers as a nice little salute to him, in fact, but this wasn’t it. He was sure--having studied the music archives listing before liftoff as a routine thing to do. And the band? Yes, either Paul White’s or Ziggy Silverspoon’s . Struggling to his feet, Kipp spun around, unsure what to do. He knew mission control was going berserk on Earth, but he had to find out something more. He ran straight for the doors that led into the martian depths. They too, when he came up, were open, as if no one cared anymore who came or went. He slowed down, taking the most careful steps of his life, even including those that put his feet down from the Mars shuttle, the first man in history to set foot on Martian soil. A step, then another, and finally he was through the doors, standing inside what seemed, at first glance, St. Peter’s Basilica with the lights off. But, no, first impressions were misleading. Kipp saw it wasn’t any such thing. It was a long hall, leading into another hall, pillared, tiled with square brown and white tiles, the surfaces of everything highly polished, and the only thing spoiling the effect, deep gouges tracking right through the center. Light flowed down through sky lights, illuminating portions of the vast spaces more brightly, but it was all mellow, golden light, blending well with the brownish, marble-like stone. Stone everywhere! Not one artifact, just the polished, beautifully cut and worked stonework! It may not have been a basilica, but it surely was a palace for someone, Kipp decided. And how about M2 and M3--did they contain palaces too? Were they all interconnected? Was there an entire city beneath the triliths, which only served as entrances? Following the track of the abrasions and gouges, he walked into the hall about two hundred meters. Dimly recessed, the hall wasn’t clean of artifacts after all. Kipp saw a face looming--a carved hawklike face set on a giant, theiomorphicized man’s body. Set between giant pillars, the statue took Kip’s breath away. He could not mistake it, that he was dealing with a civilization, and all this was no trickery of wind erosion. Two hundred meters further on down the hall, off in a side chapel, Kipp found yet another--a woman-bodied hawk this time. Her hands held pharaonic-style cartouches as well, but the writing was not hieroglyphic. At this point, having left the gouged-out track, Kipp felt utterly lost. He knew he had also abandoned his mission, so deep had he sunk into an unfathomable mystery that he could not explain, and he desperately needed to find his way out, back to sanity and facts he could understand and familiar faces. He started back, but the chapel opened to another, and another, and he wasn’t turning right, he thought, for the maze seemed endless. He was sure he should have reached the first set of outer doors by now. He looked around. No sign of indentations anywhere, no matter where he searched. A horrible feeling engulfed him! He knew he was lost. He tried to find the raptor-headed statues, to fix his last position. But they too eluded him. Why hadn’t he fixed his position then? He could not believe he had been so careless. Not caring to penetrate and explore the various doored chambers he came to, he searched in an increasingly liquid state for the statues. The strain was getting to him. His suit’s air conditioning was failing to keep up with all the body moisture and salinity he was putting out. It simply had not been designed for so much racing about for so long a period. He was allowed an ounce an hour, absolutely no more. But a veritable Niagara was pouring from his forehead, chest and arms. He knew he had to slow down, or he might drown in his own body fluids. His visor was steamed up, he was nearly blinded. He turned this way, then the next in desperation, and came face to face with what seemed like a black wall. Then torn up floor, and riveted metal! Lots of it! And despite soot and signs of intense fire and abrasion, the still discerible letters: G-EAOU. What? From what he could still see, and feel, this had been a fuselage. He felt jagged holes too, where double wings had been ripped off. A biplane on Mars? Since the fuselage lay on the floor without landing gear, he looked up into the first cockpit, and recoiled. Two skeletons, clothing in shreds but the rest intact! But he knew there was a second cockpit. Where there dead men in there too? Something gleamed in his eye. He bent and found a piece of somebody’s spacesuit, from a glove, caught under the edge of the fuselage. The artifact was unmistakable. He was wearing the same kind of suit and gloves, so that meant somebody had lost a glove or even a hand. He didn’t stop to find out what business NASA had conducted there, and obviously bungled, so that somebody’s suit had been fatally compromised. No, he wasted no more time. He fled. Crashing into a pillar, he finally came to his senses. Clutching at the pillar, his chest heaving as he gasped for air, he tried to get control of his panic. Then his fingers told him what his eyes--behind the clouded visor--could not. This was not another column. Eagerly, hungrily, his fingers explored and then he knew: he had found one of the statues. And just beyond would be the track of the mystery land rover dragging something in--his only life-line out of this underground hell! Then his heart sank. This couldn’t be the statue. It was a large object, yes, but it was more squat, and was ceramic-covered metal. He continued feeling the thing, a large object about the size of a classic VW van--its sides crumbling and flaking off onto his hands. Then it dawned on him to what era the technology of the thing belonged. He felt for a hatch and found it. Open! Reaching in, he could touch instruments. His trips to space museums to see archaic, recovered NASA mission modules now paid off royally. Atomic powered, the module responded to his command at a touch of his fingers on the controls. Telemetry streamed out, filling a monitoring interior screen that also illuminated the unmanned module. His head stuck into the module, Kipp was struck aghast--1994TL66! This module had been to a miniplanet the size of Texas obiting beyond Pluto and then somehow ended up back on Mars beneath the surface? Kipp’s eyes widened in the dark. Whether he died on the Red Planet or not, he had to find out something first. Who had accomplished these feats--the G-EAOU, and now the 1994TL66 probe presumably lost all these years after NASA’s link with it was unexplanably cut and its telemetry sailed off to parts unknown? Where they one and the same phenomenon? He watched the imaging kicked back out of the data when he requested it. Hitting PAUSE on a frame, he stared at what looked like endless rows of Neandertals or Cro-Magnons, all contorted hideously, straining against chains where they were held in place in a kind of huge cavern-warehouse. Were they the miners? Whose? And why had they frozen in place? Had there been a terrible accident in the mine and the killing surface temperature of the miniplanet reached penetrated to the workers? And what were they mining? It had to be something as valuable as gold, or even more valuable to warrant all the trouble it took. But the martian dusk would not wait for further investigation. The surface temperature was plunging outside, and even here underground Kipp could feel his window of escape was rapidly closing. He had to leave now, or he would end up another exhibit along with G-EAOU and the officially lost, now found NASA Outer Kuiper Cometary Belt Probe. Just then, as Commander Mina reached to turn off the imaging and shut down the probe, a voice paralyzed him momentarily, preceded by a sniggering chuckle and a loud burb possibly brought on by too much Gatorade and honey-roasted peanuts! Afterwards, NASA spin doctors put the best construction possible on Astronaut-Mars-Walker Mina’s actions in abandoning his duties and disappearing for a long interval into a martian cave. His career was sharply curtailed, and he disappeared from public view, attended by black-suited bodyguards, CIA-NRA agents. Nothing was leaked about his findings to the public. JPL’s Carlisle kept a lid on any funny business on Mars being reported, and she soon resigned from her UN-US post and devoted her energies to scuba-diving and performing in occasional filmed documentaries about coral reef habitats for the Discovery Science channels. Mina’s NASA file was pulled by someone, possibly the UN secretary-general, and the case passed into oblivion. Kipp Mina’s "nursing-home" for the "mentally-challenged" was located in a Maryland gated community (no one else was allowed residence and no reporters were given clearance). After a while, with his parents and family kept quiet with the usual means, everyone else forgot poor Kipp, except those who were experts in handling “absorbed clients.” It is true he created a momentary furor with his debriefing remark at JPL that he had discovered a “ classic Mars civilization” hidden under stupendous triliths, a Randolph Hearst-style palatial complex with gigantic, rock-hewn chambers and statuary, and “something else unthinkable and unmentionable concerning the Spacy Agency.” Those who wished to discuss his statement found themselves retired early. Taking the cue, others who sincerely desired to remain on board NASA and JPL managed to keep their mouths shut. Before the confab could take place, astronomers observed a plume of ejected material rise above the martian surface, and the location was the south-eastern flank of Olympus Mons. Asked about it, they could only speculate that a volcanic vent had collapsed, releasing dust into the thin, martian atmosphere. The monster volcano itself was stone dead, they assured the world public. The Mars colonization program could go forward without any fear of interference from the extinct volcano. Allowed by his guards to watch only the Classic Movies channel, Mina sipped a sedative-laced soft drink and missed the news reports on the Olympus Mons dust plume. Uwe Hantsbo’s FAX to Mina, masquerading as a NASA retiree games poopsheet? A site supervisor screened all contacts between him and the outside world and weeded it out by getting so interested in Hantsbo’s crosswords and word circle puzzles that he failed to turn it over to Kipp. So what really happened on Mars? Mina would carry his strange and mysterious discoveries to his grave. Kipp’s problem too, was that he had dared--and lost to more powerful forces.